Bit of a callback to this. Version 3 of the speech bubbles, due to a few people wanting to see what a combination of styles would look like. I really like these bubbles crisp clean and stylized with a very easy to read font. Dunno if it’s appropriate here, but I’ve personally been soured against that from my own childhood. Eventually you hit the ‘whatever’ stage where the kid doesn’t even fight against the parent’s wishes. And also has no drive to do anything on their own. What´s the alternative here? Letting this thing fester forever? If I were Todd I´d tell Heather´s parents that he and Selkie will accept the invitation as soon as Selkie can see that Heather has changed for the better. I dunno, try talking it out? Selkie, Todd, Heather, her parents, and a neutral mediator like Mrs. Afkhami? (and probably Amanda, when it reveals that she’s the real problem) Deconstruct the issue and it’s causes, and make it clear why bullying is bad for everyone involved? It’s worth a shot. Even if the kids throw it out later. Having been bullied for years in school, I´m not a big fan of “talking it out” with bullies. Bullying is wrong, and it needs to stop – end of discussion. The only “talk” with bullies I´ve ever seen that worked out was the one where the teachers told the bully´s father that, if just one additional tiny incident occurred, his son would be kicked out of the school. 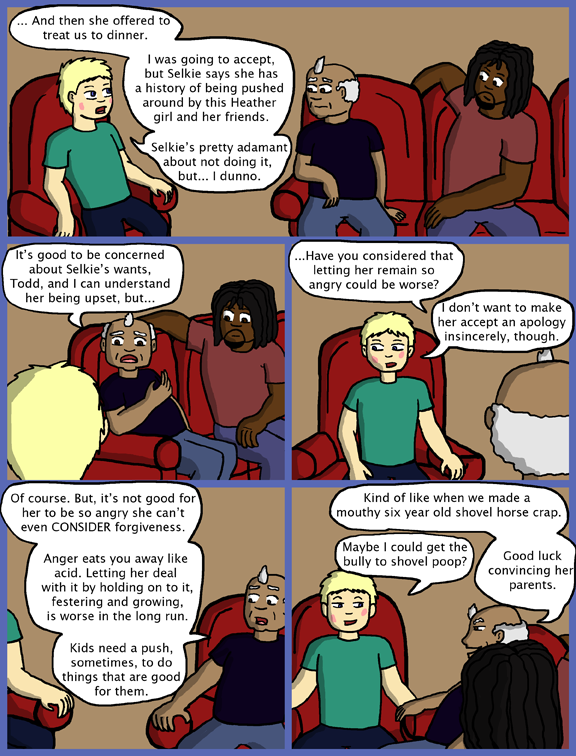 Once Heather has stopped bullying Selkie, and gives her a genuine, honest apology, Selkie can accept that – and I would be fully in favor of Todd *making* Selkie accept it, if it comes to that. But until that? Tough luck, bullies. BTW, aren´t Todd and Selkie due for a check-up visit by the orphanage (presumably by Mrs Haversham-Zhang) soon? That would be a good opportunity to talk with her about the bullying; she could then sort things out with Amanda and Keisha. Congratulations on your two years of something I’d call success here in cyberspace. As a denizen of cyberspace, we welcome you, and proudly hail your achievements. I love the speech bubble style! It really does look more at home with the art, while maintaining the crispness of the first style. And thank you for changing back to your font. I find it much easier to read. And wow, two years already? I started reading Selkie about 10 comics in. It doesn’t seem like that long ago. But I bet that’s a factor of comic strip time. 🙂 Congrats, Dave! I like the new bubbles a lot. he indeed has a point some people including can become very horrid if they keep it in. I like this combination of text and bubbles too. They’re much clearer with a black outline, yet the text remains easily readable. As for Selkie’s issue, I think that they should get Amanda and Keisha together to sit down, with adults present (parents, teacher, orphanage people) and talk of the issue. Rather than force Heather and Selkie to deal with it while their parents make nice for appearances’ sake. I really like the new speech bubbles, I think they’re a good combination of a style that fits the comic (a little wibble-wobble in a line never hurt anyone) and doesn’t feel too empty (like the all-white did). I think I liked the other text a bit better, though. Have to agree with grandpa there. Letting a child sort through their emotions and figure out what’s what is great, but sometimes they need that little extra push in the right direction. Accepting apologies is a good start. She’s been teased and rejected enough in her short life that it must be very hard for her (if not nearly impossible) to trust those that have hurt her emotionally. Reminds me a little of myself as kid, i got teased a lot and it really affected how I viewed myself. Been a looooooooooooong while since I commented! Been lovin this much more than before! Ah, Dave, I think you could really use an Archive page, like Tom said on the FAQ. Those drawings are so cute! Thanks! OH, and I added an archive drop down that sorts by month below the comic, if that helps. I like these bubbles or the ones in the previous strip. I don’t care for the line-less bubbles of two strips ago. The speech bubbles do look a lot better with the black outlines, and it is readable, but they also seem a little distracting not being clear shapes, and the edges coming in too close to the text in places. I do like the joins with these better than with the old style of thin lines joining them, but the wonkyness for me makes them look less… professional, if that is the right word. I guess I’d prefer the speech bubbles to look less “free-hand” but still have the bubbles joining into each other rather than having thin lines joining bubbles. Lot of my favorite webcomics have anniversaries coming up; is there a tendency to launch ’em in the summer? Congrats! Have to agree that Todd’s father is on the right track here. Healing from something like this is not instantaneous. Even if in the beginning Heather’s apology and Selkie’s acceptance are not completely sincere, time and the right kind of reinforcement will eventually close the gap, however imperfectly. That is, Selkie will likely never like Heather, but she can hopefully accept that the latter is sorry and move on, rather than letting the memory rankle. I’ve also noticed a lot of comic anniversaries are happening around this time. I’ve been wondering something. 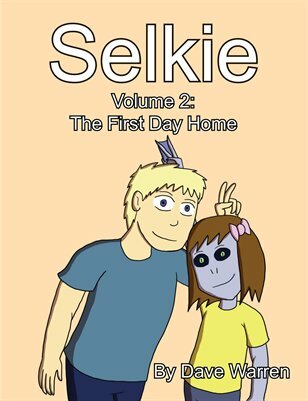 Will there ever be a time when a book of Selkie comics will be published? And if you plan to publish Selkie books, how far in the future do you estimate it could happen? I’d love to share this comic with my family, but they don’t like looking at computer screens as much as I do and so I’m curious if that could ever be a way to share it with them. I’ve looked into Selkie print books off and on for the past few months, actually. The big problem with print editions is that every time I price check, it comes to about $25-$30 per book to print the first two story arcs (for comparison, print editions of other webcomics I read tend to sell for $10-$15, which is AFTER production and extras and profit margins). And that’s just “at-cost”, and before I add stuff like book-edition incentives, extra content, etc. I would love to be proven wrong, but I feel like if Selkie books cost $25-$30 apiece there is a strong chance I’d end up with a bunch of very flexible coasters. I am also exploring e-book avenues as a potential start-up. But it’s a bit down the line at this point. And we’re back to the hand-drawn bubbles… The other ones looked so much neater. Hahaha, I remember the pooper-scooper punishment. xD I hope Todd takes his dad’s advice. I have to say that I prefer the lines that didn’t look hand drawn. I don’t mind the wobblies, but they are so thick that I find them distracting. Still love the story though and I’d be super excited to see e-books!! !